Things are going to be going a bit quiet on here shortly, due to the work situation, but before that happens I’ve got one last big trip coming up. After that I’m only going to be able to get out for the odd weekend. So it’s time to make the most of the time outdoors I still have, and to eke out what I can from the rest with some mini-adventures. Next Saturday I head down to Cornwall to do this year’s chunk of South West Coast Path with my dad. We’ve been doing this every year since 2008, except for a blip last year when Dad couldn’t come due to some last minute family matters. So last year I did the stretch from Plymouth to St Austell by myself, which gave us a bit of a dilemma for this year – to resume where I finished last year or start again from Plymouth where he last finished ? In the end, we decided to pick the walk up from the halfway point in Looe – not as some sort of compromise though: the stretch from Plymouth to Looe was the less rewarding part of last year’s walk, so we decided to repeat the two good days. That way he didn’t miss anything significant, and I have to “put up with” doing the best bit again. Hardship indeed. As usual we’ll be B&B’ing it, something which is now rare for me except on this annual walk. So this makes for a light pack at least. With a full diary this week, I’m starting to assemble the gear today – more about that later. 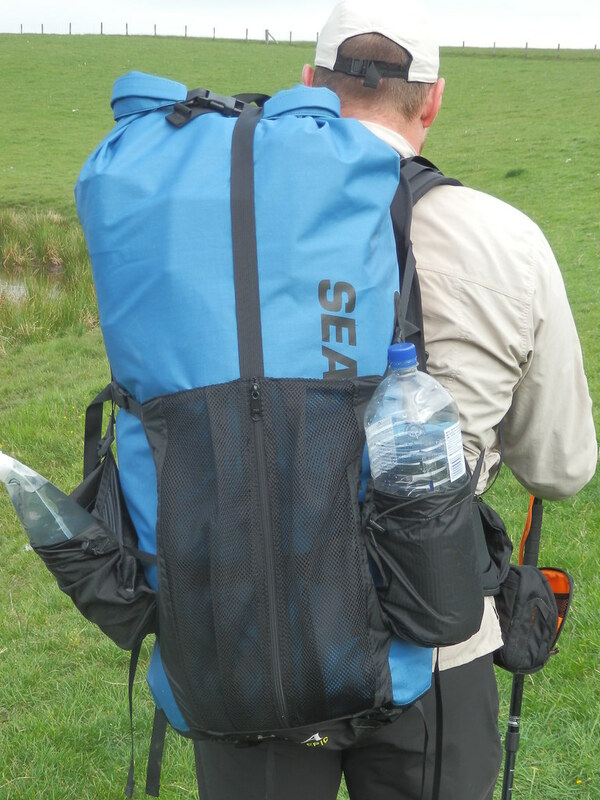 Last weekend I finally got out and used my new ULA Epic pack, it having proved too small for the excessive amount of gear I took to the Lakes in March and Wales in April. I wasn’t sure how well it would carry, but once I’d packed it properly and fiddled with the countless straps it wasn’t too bad. I think with a bit more use it will become my large pack of choice, although it is going to force me to cut down what I take with me a bit more ruthlessly. But that can’t be a bad thing, as I know I’ve been far too heavily loaded on my trips this year. I’ll give it a bit more use and then write a review – this is quite a rare pack in the UK, and there aren’t that many reviews out there. On last weekend’s camp I also tried out the tent underlay recommended by Robin. It wasn’t really cold or manky enough to really get any idea how it performed though. However, the piece I used (a torso length piece about 70cm wide) folded up well and slipped inside the Epic, and also fitted between the dry bag and the back system. More testing is needed in terms of its insulation properties – for which I obviously need a cold camp. But I’m already thinking of using a piece of this (I bought a 2m length so that I could have a play and in case I changed my mind about the shape piece I wanted to cut) to make an improved back pad for my Golite Jam – the included pad has buckled and makes the pack uncomfortable when loaded to its limit. I think a double or even triple folded piece of the underlay will do the job well, and if I’m clever in the shaping, it will also double as my additional sleeping insulation or a sit mat. Finally, I’ve been sent a tent by Go Outdoors to put through its paces. Not one of their higher-end brand items unfortunately, nor the glorified coffin-shaped tarp item I wanted to try, but a 3 man budget tent from their HiGear range. As it will be at least a couple of weeks before I can get out for a proper camp in it, it’s been up in the garden for a couple of days, being kept company by Monica and my old Quechua T2 Ultralight Pro, airing after their trip to Wales last week. So the garden’s had something of a music festival look to it, apart from the mud thankfully. Please direct any complaints about the pitching of the T2 in the picture below to my son, who takes a fairly laid back approach to guying. I’d almost got the T2 and Scarp dry and aired before the heavens opened and I was back to square one. A passing band of heavy showers and winds descended on the tents for most of yesterday afternoon. The confines of the garden (and Master Hillplodder’s pitching abilities) meant the T2’s tail collapsed, and Monica was taking a surprising buffeting herself – giving me a sweet smile and one of her “can I have my crossing poles, please” looks. The Atom, however, looked pretty solid throughout and despite some pretty casual guying on my part. So I may have upset Monica a bit by pointing to the Atom and summarily dismissing her request. As is traditional with new tents in the Hillplodder household, I spent last night in the Atom and a pretty good night it was too – in contrast to my first night in Monica last year. With my POE Ether Thermo 6 mat off at (indoors ?!?) scout camp with Little Miss Hillplodder, all I had was an amputated Karrimat and a chunk of the tent underlay to lie on. Whilst a bit more austere than I like, it was actually ok, and I slept the whole night through despite a constant symphony of the usual urban nocturnal sounds (foxes, the distant hum of M25 traffic, pub kick-out time, drive-by shootings etc – you get the idea). The tent itself wasn’t particularly challenged last night on a still and dry night. But it had stood up ok the previous wetter and windier night. So initial impressions are that it does what it says on the tin. The pegs are absolute crap though, that I can say already, although that’s hardly a surprise. A more thorough review will follow in due course. As I said earlier, the SWCP is likely to be my last significant multi-day trip until next year, so I’ve started thinking about how I will keep sane in the meantime. I have a trip to Norway coming up – a family holiday rather than an outdoorsy one, but I’m hoping to do a walk or two and am going to try to track the cruise route on Social Hiking as an experiment via my Spot Connect. That should also allow me to tweet without incurring roaming data or call charges, as I’ve got a bundle of Type and Send messages to use up. Norway-aside, the main strategy for maintaining sanity is a collection of mini-adventures (i.e. slightly bigger than the overnight micro-adventure). The idea is to get out to the hills for a full weekend making maximum use of the time available. Although this won’t allow any really big walks, and will be heavily constrained by access to trains and buses, already it is surprising what I might be able to achieve. I know from past experience, that getting to the hills for a normal weekend’s length can feel like a much longer time and even with a few hours journey time it still feels worth it. My drive to the Radnor Forest for a walk and overnight camp last weekend, was the first of these outings. Cefn yr Ystrad, a Nuttall straggler that I missed on the Cambrian Way last month. A few miles north of Merthyr Tydfil, which is on the railway. Pen Twyn Mawr, which I couldn’t be bothered to do the extra 2 mile out and back round trip from Pen y Gadair Fawr on that same Cambrian Way walk. A walk from Abergavenny station will sort this out. The pair of Nuttalls above the Elan Valley. A bit more epic this one, but just about reachable from the Shropshire to Llanelli railway line. At least 26 of my 29 remaining Wainwrights (and maybe even all of them) could be picked off this way because they are accessible from Penrith or Keswick. Generally speaking, almost any area that’s no more than about 3-4 hours train time from London, and which doesn’t involve a load of onward travel faffing about at the destination, is reachable under this strategy (this may rule out the Wasdale part of the Lakes where the other 3 Wainwrights are – the onward journey from Lancaster around the coastal line just eats too much time. Unless I can come up with a viable walk from Borrowdale, Buttermere or Langdale that fits into the time window). If this strategy works, and there’s no reason why it won’t, then I may also start working through the huge list of hills in the Northern Pennines that are standing between me and the completion of the English Nuttalls. The other thing is meetups, as the constraints of most people working mean these have to fit into weekends. The only limiting factor is, therefore, location (by which I really mean travel time). I hope to fit a few of these in, as I enjoyed all of the ones last year – the Yorkshire 3 Peaks and Carneddau in particular being examples of those that fitted into a normal weekend timespan. Already a meetup in the Peak is looking likely and I’m hoping a pencilled-in walk in the Forest of Bowland with Stuart also gets inked-in to the diary, it having had to be pulled once already due to his foot injury. The long-range plan is to take a good chunk of time out after this work project is done, and so clearly some time will be spent in planning for this when I can’t get out. Potentially on the cards for next year are a push to finish the Wainwrights (assuming I don’t manage to do them through weekends), certainly finishing the Cambrian Way, the next chunk of the SWCP and I’m sure a whole host of smaller adventures.